Tormaresca is an Italian estate located in Puglia, the heel of Italy’s boot. Begun in 1998 by the Antinori family, this property showcases wines made from indigenous grape varieties. The resultant products taste not merely good, but special – different and wildly intriguing. Today’s wine features the Fiano grape, originally named Vitis Apiana, because bees were so very attracted to the vine’s sweet grapes. Deep yellow hue. Gracefully perfumed with apple and pear elements that seem positively windswept. Background notes of creamy honey surround the sinuses. This drinks dry and smoothly with a medium body and alert acids on the finish. Flavors include crisp apple and a crackling, bitter almond element. Begs for calamari, pork or even a full-blown Cacciucco. Drink now-2015. 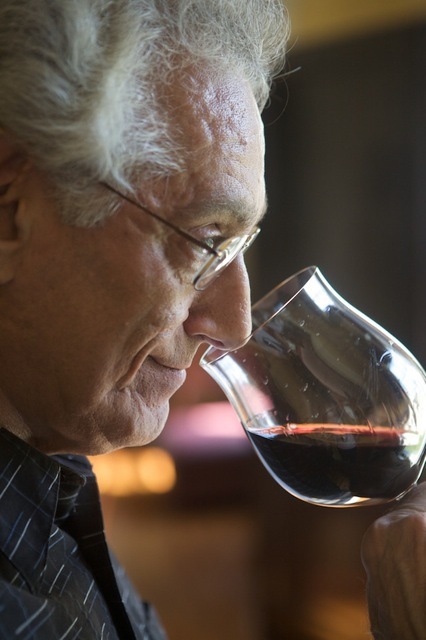 Bordeaux winemaker Lionel Latorse was recently showing off wines from his own estate, as well as others, for which he serves as wine making consultant. One of these consulting jobs features Chateau De La Ligne, a right bank Bordeaux Supérieur located in the region called Entre Deux Mers (meaning “between two rivers” – not oceans). In what was considered a miserable summer by most accounts (in 2007, mildew was rampant), the grape selection process must have been extreme here, because the wine shows little sign of the inherent difficulties. This ancient property has been reborn under the ownership of Irishman Terry Cross and, although the vines are young, the final blend smells and tastes lush and ripely sweet. Good depth and a penetrating nose of subtle berry, black currant and deft oak underpinning suggesting cedar forest. Smells like right bank Merlot – a good and special thing! Mouth feel is fairly plush and long with the berry flavors both prominent and balanced. A hint of tartness is the only suggestion of vintage issues, but it disturbs the overall pleasurability not at all. Fifty percent new oak barrels with 60 percent Merlot, 30 percent Cabernet Sauvignon and 10 percent Cabernet Franc (the wine’s “recipe.”) Fine with potato gnocchi, lamb or a mushroom-based pilaf. Drink now. 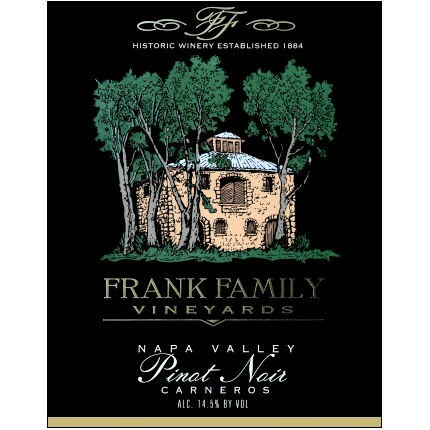 I thoroughly enjoyed visiting Napa Valley’s Frank Family Vineyards a few years back. They are known for their hospitality and the property teems with many young (and not so young), excitable, “wanting to learn” patrons. While sitting on the veranda, walking the grounds and sipping the bounty, the winery encourages a decidedly unstuffy atmosphere. Standards are high here, with an exciting book of whites, reds and small-production reserves that aim for the stars. Although many people think of them as Chardonnay/Cabernet-centric, one of their most exciting wines in my book is their regular bottling of Carneros Pinot Noir. This is a crowd pleaser that seems to gain finesse with each ensuing vintage. It can easily compare to many boutique offerings at twice the price. Vibrant, deep burgundy color – what else! Bright, crisp strawberry, cherry and rhubarb notes, with piquant elements of fresh fine herbs, forest scents, toast and leather. Flavors are generous with a sappy, mouth-filling texture, a cherry laden medium body and a luscious finish with refreshing acids and fine tannins. Perhaps a “bigger” wine stylistically than other Carneros favorites, but a lovely mouthful for poultry, standing rib roast or even a pasta carbonara. Drink now-2017.